Gershom Scholem (December 5, 1897 – February 21, 1982), also known as Gerhard Scholem, was a Jewish philosopher and historian widely regarded as the modern founder of the scholarly study of Kabbalah. Raised in Germany, he rejected his parents' assimilationist views, and immigrated to Palestine in 1923. He became a leading figure in the Zionist intellectual community of Palestine before World War II, and later became the first professor of Jewish mysticism at the Hebrew University of Jerusalem. Although a leading student of mysticism and an ardent Zionist, Scholem remained a secular Jew, rather than a religious one, throughout his life. Scholem is best known for his collection of lectures, Major Trends in Jewish Mysticism (1941), and for his biography, Sabbatai Zevi, the Mystical Messiah (1973), as well as several other books on kabbalism. His collected speeches and essays, published as On Kabbalah and its Symbolism (1965), helped to spread knowledge of Jewish mysticism among Jews and non-Jews alike. He published over 40 volumes and nearly 700 articles. As a teacher, he trained three generations of scholars of Kabbala, many of whom still teach. Scholem was awarded the Israel Prize in 1958, and was elected president of the Israel Academy of Sciences and Humanities in 1968. Scholem was born in Berlin, to Arthur Scholem and Betty Hirsch Scholem. His interest in Judaica was strongly opposed by his father, a successful printer with liberal and assimilationist views. Thanks to his mother's intervention, he was allowed to study Hebrew and the Talmud with an Orthodox rabbi and soon became interested in the Kabbalah, although he never became personally religious. Scholem's friend, Zalman Shazar, was president of Israel from 1963-1973. Banished from home for his Zionist and anti-German-nationalist views, he befriended Zalman Shazar, a future president of Israel, and several other young Zionists in Berlin, with whom he lived. Scholem also studied mathematics, philosophy, and Hebrew at the University of Berlin, where he came into contact with Martin Buber and Walter Benjamin. He was in Bern, Switzerland, in 1918, with Benjamin, when he met Elsa Burckhardt, who became his first wife. He returned to Germany in 1919, where he received a degree in semitic languages at the University of Munich. Scholem wrote his doctoral thesis on the oldest known kabbalistic text, Sefer ha-Bahir. Influenced by Buber and his other Zionist friends, he emigrated, in 1923, to the British Mandate of Palestine, later Israel, where he devoted his time to studying Jewish mysticism. During this time, he worked as a librarian and eventually became the head of the Department of Hebrew and Judaica at the newly founded National Library. In this position, he was able to collect and organize hundreds of kabbalistic texts, in which few scholars had any interest at the time. He later became a lecturer in Judaica at the Hebrew University of Jerusalem. Scholem taught the Kabbalah and mysticism from a scientific point of view. He became the first professor of Jewish mysticism at the university in 1933. In 1936, he married his second wife, Fania Freud. In Jewish academic circles of the early twentieth century, Jewish mysticism was rarely studied and was often seen as an embarrassment. Directed to a prominent rabbi who was an "expert" on Kabbalah, Scholem noticed the rabbi's many books on the subject and asked about them, only to be told: "This trash? Why would I waste my time reading nonsense like this" (Robinson 2000, p. 396). Scholem, however, recognized that kabbalistic studies represented a major and underdeveloped field of study. He thus continued his arduous work of collecting and cataloging manuscripts. His first major publications after his dissertation were all bibliographical works related to this work: Bibliographia Kabbalistica (1927), Kitvei Yad ha-Kabbala (1930), and Perakim le-Toldot sifrut ha-Kabbala (1931). His major work on Sabbateanism was published in its preliminary form as Redemption Though Sin, published in 1936, with a revised English version appearing in 1971, under the title, Sabbatai Zevi: Mystical Messiah. In this work, Scholem taught that there are two kinds of Jewish messianism. The first is restorative, meaning that it seeks the restoration of the Davidic monarchy. The second is apocalyptic, or "utopian-catastrophic." These two trends in the Jewish messianic hope first come together in the phenomenon of Sabbateanism. An artist's conception of a medieval kabbalist. In the late 1930s, Scholem gave a series of lectures at the Jewish Institute of Religion in New York, published as Major Trends in Jewish Mysticism, in 1941, and considered by many to be his most influential work. Scholem took a dialectical approach to the understanding of the history of Jewish mysticism. For example, he did not see Sabbateanism as ending in failure but—in tension with the conservative Talmudism of its time—setting the conditions for the emergence of Jewish modernity. Scholem directly contrasted his historiographical approach to the study of Jewish mysticism with the approach of the nineteenth century school of the Wissenschaft des Judentums ("Science of Judaism"). The analysis of Judaism carried out by the Wissenschaft school was flawed in two ways, according to Scholem. First, it studied Judaism as a dead object rather than as a living organism. Second, it did not consider the proper foundations of Judaism, the trans-rational force that, in Scholem's view, made the religion a living thing. In Scholem's opinion, the mythical and mystical components of Judaism in general, and of Kabblah in particular, were as important as the rational ones. He also strenuously disagreed with what he considered to be Martin Buber's personalization of Kabbalistic concepts. In Scholem's view, the research of Jewish mysticism could not be separated from its historical context. During the Biblical period, the principle of monotheism struggled against primitive mythology, without completely defeating it; and thus many irrational and magical elements remained in the Jewish religion. In the Talmudic period, some of the magical and mythic attitudes were removed in favor of the purer concept of the divine transcendence. During the medieval period, Jewish thinkers such as Maimonides, trying to eliminate the remaining irrational myths, created a more impersonal and less mystical Jewish religious tradition. Shabbetai Zevi enthroned as the Messiah. The notion of the three periods, together with his dialectical approach to Jewish history in general, led Scholem to put forward some controversial arguments. One was the idea of Hasidism as a synthesis of Talmudism and Sabbateanism. 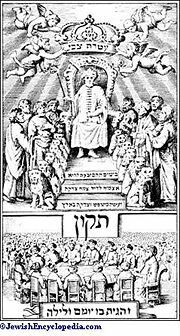 Scholem held that the major seventeenth century messianic movement led by Shabbetai Zevi was developed from the medieval Lurianic Kabbalah. Conservative talmudists then sought to neutralize Sabatteanism. Scholem believed that Hasidism had emerged as a Hegelian synthesis, maintaining certain mystical elements from Sabbateanism within the bounds of normative Judaism. This idea outraged many of those who had joined the Hasidic movement, who considered it scandalous that their community should be associated with the heretical movement of Shabbatai Zevi. Similarly, Scholem held that Reform Judaism and Jewish secularism represented a rationalist trend in reaction to the mystical enthusiasm of Hasidim and the conservatism of talmudic Orthodoxy. His implication that the contemporary Judaism of his time could benefit from an infusion of kabbalistic studies was also sometimes seen as offensive. Scholem also produced the controversial hypothesis that the source of the thirteenth century Kabbalah was a Jewish gnosticism that preceded Christian gnosticism. This is not to say that Scholem held Kabbalah itself to be ancient. However, he pointed to an earlier Jewish mysticism dating back, for example, to the Book of Enoch. The historiographical approach of Scholem also involved a linguistic theory. In contrast to Buber, Scholem believed in the power of language to invoke supernatural phenomena. In contrast to Walter Benjamin, he put the Hebrew language in a privileged position with respect to other languages, as a language with special qualities relating to the expression of mystical ideas. Gershom Scholem stands out as the seminal figure in modern and contemporary kabbalistic studies. Even beyond his theoretical and analytical work, his efforts to compile and catalog kabbalistic manuscripts in the early twentieth century created a major legacy for future scholars in this field. Moreover, as a writer and lecturer, Scholem, more than anyone else, reinvigorated the academic discussion of the Kabbalah among Jews and popularized this little known subject among Gentiles. In the year 1933, the Dutch heiress Olga Froebe-Kapteyn initiated an annual Eranos Conference in Switzerland, bringing together scholars of different religious traditions. Scholem attended and presented papers at many of these meetings. Among those attending were Carl Jung, Mircea Eliade, Paul Tillich and many others. His lectures in New York in the late 1930s and their later publication created great interest in the Kabbalah among intellectuals for the first time in more than a century. And of course, his many other books and articles left a lasting contribution. No serious academic student of the Kabbalah denies a debt to Scholem, even when he or she disagrees with his theories. Perhaps even more important, millions of people, Jews and Gentiles alike, who have studied or dabbled in the Kabbalah as a guide to personal mystical experience probably would not have done so without Scholem's pioneering work, even if they are unaware of it. Scholem was awarded the Israel Prize in 1958, and was elected president of the Israel Academy of Sciences and Humanities in 1968. Throughout his career he also played an important role in the intellectual life of Israel. He often wrote in Israeli publications and gave frequent interviews on many public issues. He remained an emeritus professor at the Hebrew University of Jerusalem until his death in 1982. Major Trends in Jewish Mysticism. New York: Schocken Books, 1946. Jewish Gnosticism, Merkabah Mysticism, and Talmudic Tradition. New York: Jewish Theological Seminary of America, 1965. Sabbatai Sevi; The Mystical Messiah, 1626-1676. Bollingen series, 93. Princeton, N.J.: Princeton University Press, 1973. ISBN 9780691099163. Kabbalah. Meridian 1974; Plume Books, 1987. ISBN 0452010071. 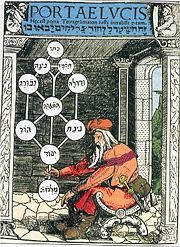 On the Kabbalah and Its Symbolism. New York: Schocken Books, 1965. ISBN 9780805202359. From Berlin to Jerusalem: Memories of My Youth. Trans. Harry Zohn, Schoken Books, 1988. ISBN 9780805208719. Origins of the Kabbalah. Philadelphia: Jewish Publication Society, 1987. ISBN 9780691073149. Biale, David. Gershom Scholem: Kabbalah and Counter-History. Cambridge, Mass: Harvard University Press, 1979. ISBN 9780674363304. Bloom, Harold. Gershom Scholem. New York: Chelsea House Publishers, 1987. ISBN 9781555462741. Mendes-Flohr, Paul R. Gershom Scholem: The Man and His Work. Albany: State University of New York Press, 1994. ISBN 9780791421260. Schäfer, Peter and Joseph Dan. Gershom Scholem's Major Trends in Jewish Mysticism 50 Years After: Proceedings of the Sixth International Conference on the History of Jewish Mysticism. Tübingen: Mohr, 1993. ISBN 9783161461439. Wasserstrom, Steven M. Religion After Religion: Gershom Scholem, Mircea Eliade, and Henry Corbin at Eranos. Princeton, N.J.: Princeton University Press, 1999. ISBN 9780691005409. This page was last modified on 20 June 2017, at 20:29.